After a lot of thought on nominating Cajun Connection in Utica, Illinois I am going to do it, & it is my pleasure to do so since it is one of my favorite resaurants in the Chicago area bar none. Cajun Connection out in Utica Illinois, has been one of the brite spots dining wise that I have encountered since moving from Naperville out to La Salle County a few years ago. 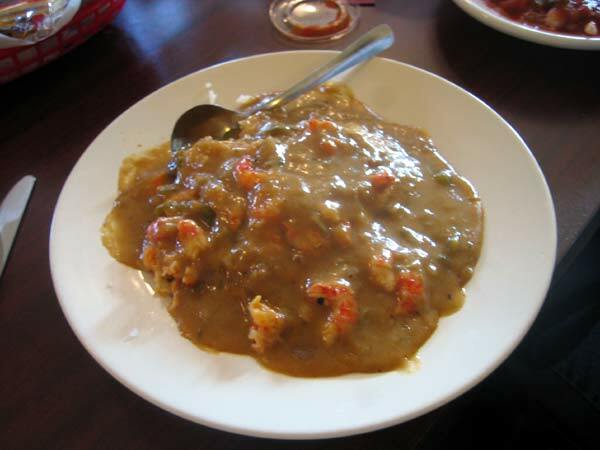 In my opinion they serve the best cajun food(gumbo, jambalaya, etouffee's, beans and rice, crawfish, fried shrimp, & fried gator) in the Chicagoland area. I have dined here maybe 30 times in the last few years, and have never had a bad meal, or bad service. I love the atmosphere, it is operated out of a converted home, and it is almost like going to a relatives for a good home cooked meal. The owner Ron & his wife(I am at a loss for her name) run a great operation. Ron typically comes out and talks to each table, and even politely prods some tables to eat/try some things on the menu they might have never tried(alligator & frog legs for example). I also believe Ron makes regular trips back to the bayou state to pick-up ingredients for his menu, that is dedication. 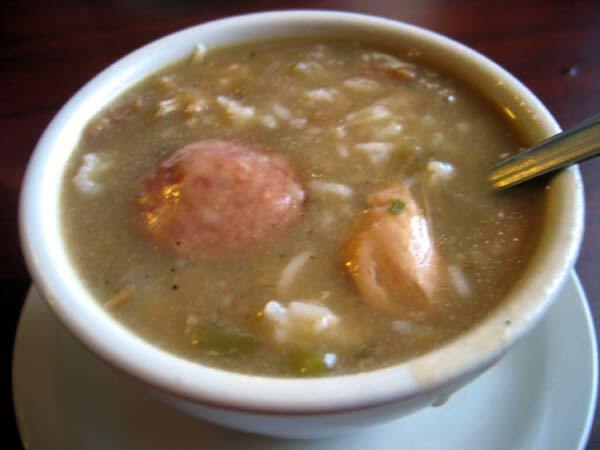 The gumbo is probably the best I have ever eaten anywhere( I often times take some to go, and I never do this at any restuarant), with chunks of slow cooked pork, and pieces of sausage, and a rich broth. 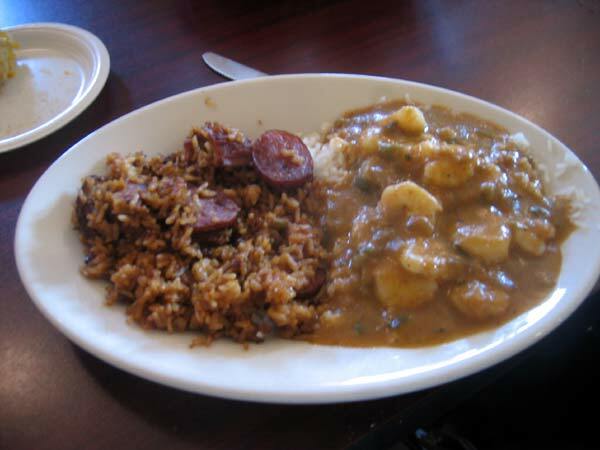 The jambalaya has a smokey quality, and the etouffee's are consistantly good as well. I have also had good ribeyes, dungeness crab, and other items that were that nights special. The real deal is the crawfish boils he holds during the sping. Where else can you get 4 lbs of perfectly cooked mud bugs for $20, and that includes a cup of gumbo( I went to 3 this past year, and I can still taste those mudbugs)? They offer beers from Louisiana by the bottle, as well as many domestics. They also serve Hurricanes, but there is not a full bar. The hours are limited, and I encourage anyone who has not been out to Cajun Connection to take a day trip(with the leaves changing colors pretty soon, and Cajun Connection's close proxemity to Starved Rock it is a perfect match to see fall colors, and have a good meal before heading home). Try to get to Cajun Connection right when they open, or expect a wait out the door. There are maybe 20 tables, and they fill up quick, but the service is quick, and good. I could not figure out how to post a link to the thread on Cajun Connection on the Beyond Chicago Board of LTH, so I will bump up that thread so people can get a good idea of what Cajun Connection is about, and its fans opinions. Also a search on Chowhound, Roadfood, and other websites talk of Cajun Connections merits. I have tried 20+ GNR winners in the past 18 months or so, and I would put Cajun Connection on that fine list in a heartbeat. Good, if not great, hearty food, freindly staff, family owned and operated, & consistant. I feel Cajun Connection is the epitome of what a GNR shoud represent. Last edited by jimswside on September 19th, 2008, 12:24 pm, edited 4 times in total. 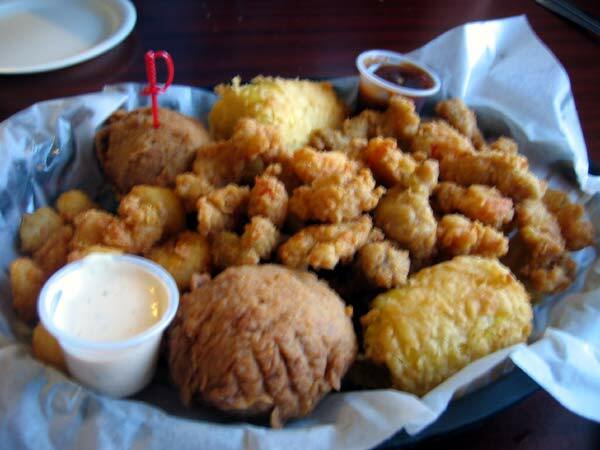 jimswside wrote: I could not figure out how to post a link to the thread on Cajun Connection on the Beyond Chicago Board of LTH, so I will bump up that thread so people can get a good idea of what Cajun Connection is about, and its fans opinions. Go to the page, copy the URL from the top of your browser and paste it to this thread. added the link, the old school way, wrote it down, and copied it.. I am not very good with computers. thanks for the help though. Anyone want to attempt a rationale for how Utica is a Chicago neighborhood? Mike G wrote: Anyone want to attempt a rationale for how Utica is a Chicago neighborhood? From my perspective, it doesn't matter. I thought Stop 50 was reasonable, and I think Ron's is reasonable (noting that I've never been to either.) If there are places that enough people on the board actually know enough about and care enough about to otherwise earn a GNR award, it barely matters where they are. I believe that the agreed upon definition when Stop 50 was up for a GNR was that if you can drive there, eat, and get back in a day it could qualify, or something like that. But it is up to the LTH members (yes, that is all of us, each and every one) to decide on this nomination. I plan to eat there sometime soon, Ron. From my point of view, Utica is a heckuva lot quicker to get to than most places in Evanston, but that is starting from Naperville. Oh, and I guess I need to post on my (wonderful) recent visit to Stop 50 - thanks for the reminder. Actually, the only discussion I remember was the feeling that places that exist mainly to cater to Chicagoans are Chicagoland-- so Lake Geneva would qualify, for instance-- but places that exist in and of themselves, like Kenosha or Racine, don't. But that was probably me who said that, so don't take it as any kind of consensus. Nevertheless, it does make sense to me, that I can buy a small town outside of Chicago as part of our area a lot easier than I can a medium-sized place for whom "the big city" is more likely Milwaukee, anyway. Jim, you know I'm a big fan and have been going to Ron's for about 4 years now. I will step up and second your nomination! Ron's personality alone makes the place award winning! I will be there for the presentation, just let me know! LikestoEatout wrote: Jim, you know I'm a big fan and have been going to Ron's for about 4 years now. I will step up and second your nomination! Ron's personality alone makes the place award winning! I will be there for the presentation, just let me know! thank you, I was hoping you would be on board. I've always wanted to try Ron's, but never was in that area during his short business hours. I'm going to try to make a special trip in the next couple of weeks. Do you think it will be easier to get in on Thursday night, rather than on Friday or Saturday? It's a long drive and I don't want to wait any longer than I have to or be told, that he's out of food. stevez wrote: I've always wanted to try Ron's, but never was in that area during his short business hours. I'm going to try to make a special trip in the next couple of weeks. Do you think it will be easier to get in on Thursday night, rather than on Friday or Saturday? It's a long drive and I don't want to wait any longer than I have to or be told, that he's out of food. I would be glad to meet you or anyone for dinner there if you are interested..
Friday traffic to get out to LaSalle County is a little heavier than other days. Thursday nights in my experience are less crowded than a Friday or Saturday night, with that said I typically get there right when they open, so I wont have to wait. From Burr Ridge where I work, I canbe out there in about an hour, I would take the I-355 extension down to I-80 as opposed to taking I-55 to I-80. I-55 is under construction from Weber Road to I-80 right now. I'd be game for this, though not next Thursday. I was glad to have been able to try Ron's this summer, after missing it consistently a couple times in a row. I don't have a lot of experience with Cajun food, but I enjoyed it a lot, as did Sparky. Sunday is a good time to go, Ron's opens at noon. it looks like a group of folks will be heading to Cajun Connection for dinner on Thursday 10/2/2008 @ around 6:00 p.m.. Not an organized event, but a laid back get together for dinner, and perhaps a trip out to Rips in Ladd for some fried chicken as a night cap. I look forward to meeting anyone who may make the trip out on the 2nd for dinner. Just look for the guy in the White Sox hat. If you go to Ladd, then please go to Ripp's competition Lanuti's where they serve fried turtle. "Meet Your Friends at Lanuti's"
If you go to Ladd, then please go to Ripp's competition where they serve fried turtle. sounds good, if they are still open, I would like to see how their turtle stacks up to Johnnies Tap in Marseilles which serves the fried turtle on Fridays. jimswside wrote: it looks like a group of folks will be heading to Cajun Connection for dinner on Thursday 10/2/2008 @ around 6:00 p.m.. Not an organized event, but a laid back get together for dinner, and perhaps a trip out to Rips in Ladd for some fried chicken as a night cap. I'm looking forward to this as well as the fried chicken/turtle chaser. dicksond wrote: I believe that the agreed upon definition when Stop 50 was up for a GNR was that if you can drive there, eat, and get back in a day it could qualify, or something like that. That standard includes everything within 250 miles ... and where's the starting point? Downtown Chicago? O'Hare? My house? And who's "you"? Any LTHer? Are restaurants in Bridgestone's neighborhood eligible? I just had occasion to visit north central Illinois. I meant to try to go to Ron's, but timing didn't work out. However, I have a good sense of how far away this is, now, and I have to say that calling an area nearly 100 miles from the Loop "Chicagoland" is a very broad stretch. 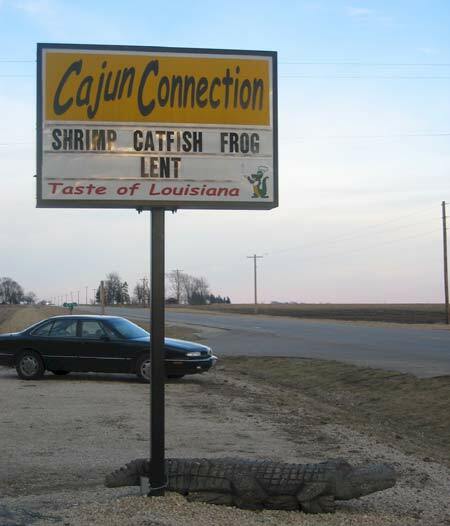 By the Cathy who-will-drive-anywhere standard, Cajun Connection is a mere 92 miles from Chicago. While I agree it is out there, I will also say it is a nice surprise to have a pretty good meal at a location one could easily predict restaurant dessert. BTW - from attending Master Gardner conferences in the past. Most people downstate consider Chicago and Utica to be northern Illinois. They don't even consider Springfield central. It is not until you are in Effingham do they begin referring to central Illinois. However most Chicago residents consider downstate anything south of Chicago. Too bad you couldn't make it there on your recent trip. I have abstained from the "too far", or "not Chicagoland" debate, because I dont think it is relevant, the food is what it is supposed to be about. I nominated Cajun Connection becauseLTH has given me many great options to eat at when I am in the city, or making a trip into the city specifically to try a GNR, I wanted to give something back for those going outside of where they live if they were ever in my "neighborhood". I wouldnt consider Indiana, or Joliet necissarily "Chicagoland" either, but am glad Amanacer Tapatio is a GNR. If the food is good people will, and should travel outside of their comfort zone/neighborhood, especially when there is nothing even close to the food @ Cajun Connection offered anywhere else in Chicago or the suburbs. I know we make almost monthly trips into Chicago & the burbs to try GNR's and gladly do so, I cant just live on fried chicken, turtle, crawfish, frog legs, & gumbo all the time.... or can I..? I happily third this nomination. As I think I alluded to in the main thread about Cajun Connection, when Antonius and I were enjoying our appetizers there back in February we were saying "This place should have a GNR." It's not only the quality of the food there, it's also the evident passion that Ron (and Amy -- right?) bring to their business. It's definitely a special place. After our meal there we now feel that it's impossible to visit Starved Rock on a day when Cajun Connection is not open. LAZ wrote: I just had occasion to visit north central Illinois. I meant to try to go to Ron's, but timing didn't work out. However, I have a good sense of how far away this is, now, and I have to say that calling an area nearly 100 miles from the Loop "Chicagoland" is a very broad stretch. But ultimately... "so what?" I don't mean that as acerbically as it probably reads, but what is the problem with recognizing a place that is otherwise qualified? I also would happily nominate Cajun Connection, if jimswside hadn't beaten me to it! We had a terrific meal there during Ron's Cajun Fest. While we did have to wait for an hour and a half for a table, both my husband and I felt it was well worth the wait. Be sure to try the Gator Bites. It was the first time I have eaten 'gator, and it was nothing like I expected. Tender and sweet, and fried to perfection. Part of my combination plate did include an etoufee and it was probably the best I've ever had. Also, leave some room to try at least one of the desserts. 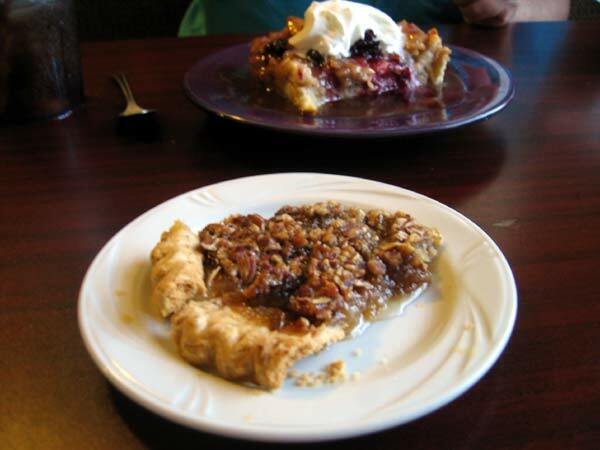 I heartily recommend the pecan pie. As I live in the southern suburbs, Cajun Connection isn't as much of a stretch from my house as it is, say, for someone who lives on the northwest side. We made it down there in an hour. I'm hoping to go down again soon, but I won't be able to make it this coming Thursday. "Build it and they will come," must have burned in Ron's mind when he opened Ron's Cajun Connection. 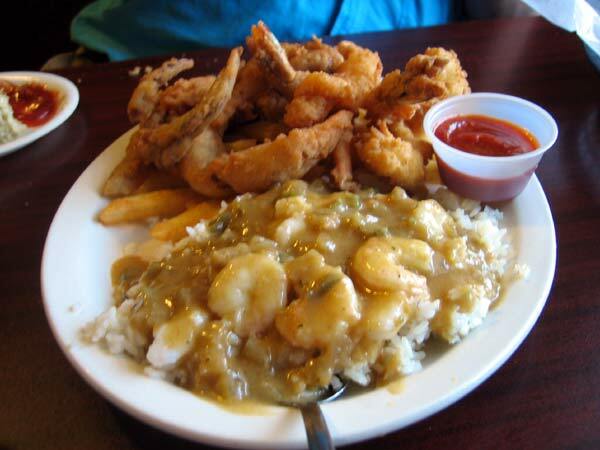 A destination Cajun restaurant a mere 92 miles west of Chicago in Utica, Illinois near Starved Rock State Park, which attracts over 1.5 million visitors a year. Did I tell you Ron ain't crazy either? Many of those visitors are from Chicago who are drawn to the nearby natural splendor, then rewarded with a fine dinner straight out of the bayous of Lousiana. 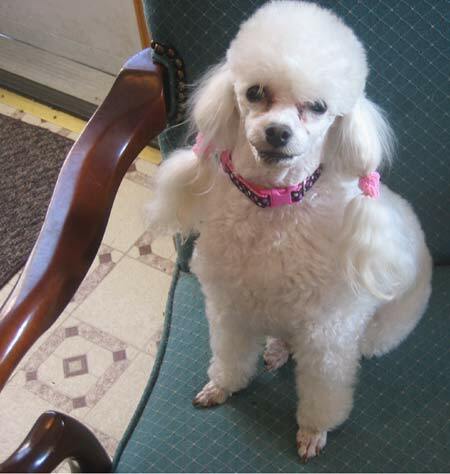 According to the lady with the darn cute miniature poodle who operates the tourist office at the first stop sign, Ron has been known to get into a truck on Sunday evening to drive down to Louisiana to personally collect ingredients for his restaurant. My very first visit to Ron's was after the 6 PM bewitching hour on Sunday. He was turning away disappointed customers when I walked up to him. I had already overheard they were closed, but I was determined to walk away with something. I simply asked for a menu and the opportunity to buy boudin. 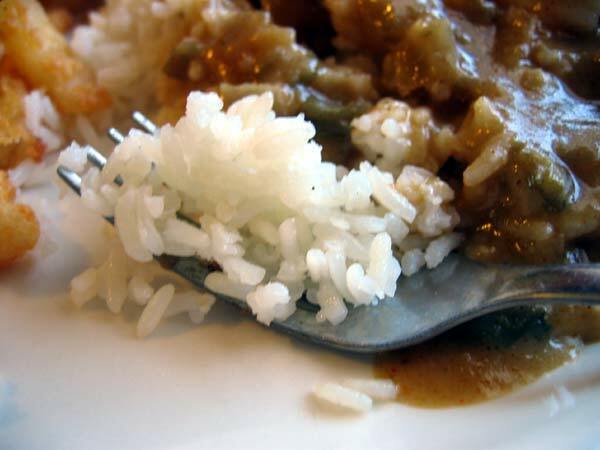 I followed him to the walk-in freezer for the boudin and watched the kitchen tidy up: all the leftover etouffee was being poured into the garbage. I got my boudin and menu, then commented, "I would have given my eye teeth to been there early enough to have eaten that lovely food." It didn't work, though recalling ccrush's ecstatic comments I knew I needed to come back soon. My next opportunity was a Sunday lunch with jimswside with his family and LikesToEatOut and her friend. I have to admit I don't always look on a map when I make plans, it never occured to me Galena was far north. So my meandering trip to Ron's turned into a time-test trial on making the best time between Galena and Utica vis-a-vis country roads. These LTH friends live far enough on the fringes of Chicago area that Ron's is a fairly local neighborhood restaurant, which is very fortunate for them. While for me, it is certainly destination dining as a day tripper with Willie's Mississippi Tamales within an hour away for those who want to double their food adventuring pleasure. Bonus round is an opportunity to stop at the R Place Truck Stop in Morris hoping to see someone eating an Ethyl: a 4-pound hamburger with all the fixings. While some may ride the tide of excess, I am most definitely a dining road warrior who maximizes my dollar, time and effort to get the fullest experience wherever I go. Mixed appetizer platter of Boudin balls, fried corn, popcorn crawfish and gator bites. Despite the different geometries and densities, each piece was fried optimally and served fresh from the fryer. Ron walks around the dining room engaging customer's in conversation. When he stopped by our table, I clearly surprised him by inquiring if the rice served was 'popcorn rice,' which turned out to be a good guess. If I stumbled upon Ron's Cajun Connection in the Utica and Starved Rock region, I would consider myself tremendously lucky. Yet I feel luckier for simply having this community's resources to draw upon to identify these unexpected jewels. While Ron's location may stretch the envelope of Chicagoland, for anyone driving to or through this region will really prize Ron's inclusion in the GNR fold-out reference. I cheerfully support Ron's Cajun Connection for a GNR. - was a crab pick provided, or did you have to use your emergency purse crab pick? I will at least bring my emergency wallet bottle opener, but if I'm going all that way, want to be sure I have all appropriate gator / frog / crab cleaning tools required to finish the job. No need for the pick. 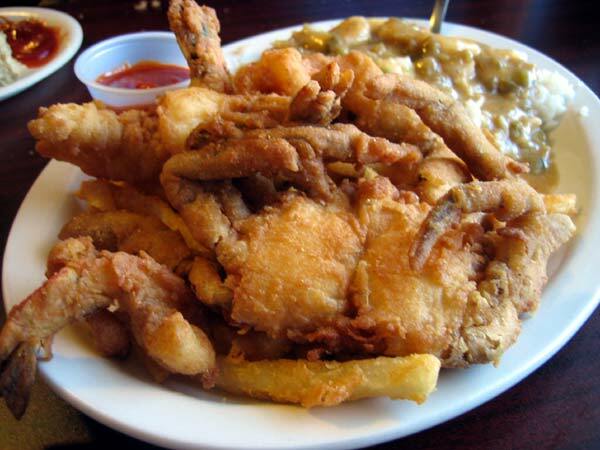 I just eat through my softshell, though I have to admit I believe that was someone else's plate at the table. All I could do was admire and kick myself for not ordering it. My pick is most definitely in my purse. CC is a remarkable place both for the food and the atmosphere and this thread has me wanting to wend my way thither as soon as possible. I strongly support this nomination. Great pics, Damn, I wish I could write as well as you do you, you brought C.C. alive with your review.